Back during the 1530s, a military planner in what is now Germany devised a rather strange means of siege warfare that would have seen cats and birds strapped with bombs to "set fire to a castle or city which you can't get at otherwise." The strange depictions appear in a manual that was discovered by BibliOdyssey in 2012. 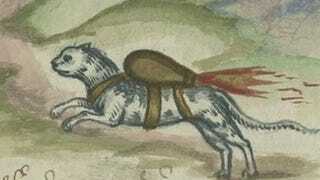 The book, which was written by artillery master Franz Helm of Cologne, has since been analyzed by University of Pennsylvania humanities expert Mitch Fraas, who, when first encountering the strange depictions, said, "I really didn't know what to make of it...It clearly looks like there's some sort of jet of fire coming out of a device strapped to these animals." The manual, which was circulated widely at the time, was written when gunpowder was changing warfare. It's filled with all sorts of bizarre ideas, including bombs packed with shrapnel, missile-like explosives studded with spikes — and of course these weaponized cats and birds. Create a small sack like a fire-arrow. If you would like to get at a town or castle, seek to obtain a cat from that place. And bind the sack to the back of the cat, ignite it, let it glow well and thereafter let the cat go, so it runs to the nearest castle or town, and out of fear it thinks to hide itself where it ends up in barn hay or straw it will be ignited. So, the idea is that you capture a cat from enemy territory, attach a bomb to its back, light the fuse — and hope like hell it runs back home where it starts a raging fire. Fraas describes it as a sort of harebrained scheme. "It seems like a really terrible idea, and very unlikely the animals would run back to where they came from," he says. "More likely they'd set your own camp on fire." Reminds me of another harebrained scheme.